Thomas Jones sits with his wife, Gloria, next to birthday balloons in honor of Thomas' son David Jones' 31st birthday in their home in Olney. Carnell Williams-Carney didn't think many people still cared. 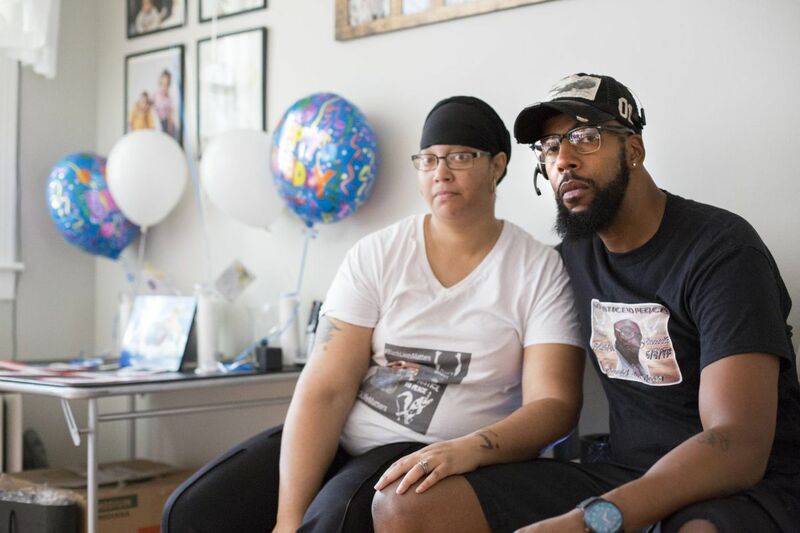 After he was shot in the back while running from police in Frankford — a shooting that left him paralyzed — he was hospitalized, then jailed for illegally carrying a gun that day. He later lost a federal lawsuit he filed against the officers. And he has since split time between apartments and assisted-living facilities because of medical problems, most of which can be traced to the shooting on July 17, 2010. "That was the day I took my last steps on my own," Williams-Carney, 36, recalled last month from his wheelchair at the Somerton Center, a treatment home for the disabled. "I've been in a chair ever since." Seven years later, the shooting that changed Williams-Carney's life has received renewed attention. Philadelphia Police Officer Ryan Pownall, who testified that he shot at Williams-Carney from behind, stands accused of shooting another man in the back, this time fatally. Activists have invoked Williams-Carney's name during near-daily disruptions and sit-ins over the shooting death of David Jones, 30, whom Pownall shot June 8 as Jones fled from a pedestrian stop in North Philadelphia. The fallout offers a window into what happens when a police officer fatally shoots someone. Similar but deeper repercussions have been felt in cities across the nation in recent years, from Ferguson, Mo., in 2014, to Chicago a year later, and Minneapolis earlier this summer. In last month's case, police have said that Pownall shot at Jones because he felt a gun on Jones while frisking him, and that Jones reached for it while scuffling with Pownall. The gun — which Jones could not have owned legally because of previous felony convictions — later was found on the ground near Pownall, not with the fleeing Jones. In addition to citing Williams-Carney's 2010 case in demanding that Pownall be fired, activists say a witness' account of the shooting of Jones throws doubt on the police story, and point to the Jones family's pain. "It just crushed me," Jones' father, Thomas, 47, said this week at his Olney home. He recently had to clean out the house his son bought less than a year ago. His six younger children, ages 4 to 15, are afraid to go outside, where they might encounter a police officer, he said. One of David Jones' siblings also had to explain to his 4-year-old sister that she cannot engage in FaceTime conversations with her older brother anymore because he's in heaven. A police spokesman said this week that the investigation into Pownall's shooting of Jones was ongoing. Police have shot five people this year, two fatally, according to department statistics, significantly less than what was typical just a few years ago. Still, Commissioner Richard Ross said that surveillance video of the shooting of Jones "gives me pause." Pownall has remained on desk duty pending the department's investigation. The District Attorney's Office is probing the case independently, a spokesman said. Numerous attempts to speak to Pownall by telephone and in person have been unsuccessful. Thomas Jones and his wife, Gloria, David Jones' stepmother, have pictures of him and his siblings hanging all over their home. They say they want justice for their deceased son, but they also know that nothing will bring him back. "It feels like somebody stole something from me," Thomas Jones said. Thomas Jones next to birthday balloons and photos of his family in honor of his son David Jones’ 31st birthday in his home in Olney Wednesday. On June 8, Thomas Jones was driving across the Delaware Memorial Bridge, listening to KYW, when he heard that police had fatally shot a man in North Philadelphia. Moments later, his wife called his cellphone with the news that it was David. "Not my son!" Thomas Jones screamed. "Not my son!" He gripped the steering wheel so tightly, he recalled, "I almost ripped it off." In a statement days after the shooting, police said Pownall was driving a man and two children to the Special Victims Unit around 6:40 p.m. to give a statement when he stopped at a traffic light at Whitaker and Hunting Park Avenues and noticed Jones driving a dirt bike "in a reckless manner." Pownall drove toward the bike, then got out and stopped Jones, patting him down, police said. Jones had pleaded guilty to drug-related charges in 2009 and 2010, but those charges do not appear to have played a role in Pownall's decision to stop him. The men began to struggle, and police said Jones reached for a gun in his waistband. When Jones broke free, police said, Pownall tried to fire his gun, but it jammed. Jones then started running, police said, and Pownall cleared his gun and fired three rounds. The man in the back of Pownall's police car has since contradicted some of those details. In an interview this month, the witness — who, given the nature of the case, asked to be identified only by his first name, Terrance — said that Pownall shot a Taser at Jones when he started to run, but that it did not knock Jones to the ground. After that, Terrance said, Pownall pulled out his gun and started to shoot. After the bullets flew, Pownall ran up to Jones, Terrance said, then ran back toward his car screaming, " 'He had a f-ing gun!' " Terrance pointed out that the gun was on the ground near the dirt bike, which, in his estimation, was 30 to 40 feet from where the bullet struck Jones — and just feet from Terrance and his children in the back of Pownall's car. "We were trapped. Technically we [couldn't] even probably shield ourselves," Terrance recalled. Pownall "put us live and direct with this." Capt. Sekou Kinebrew, a police spokesman, declined to comment on Terrance's version of events, citing the ongoing investigation. He also said he was unaware of any department policy that prohibits police officers from conducting pedestrian stops or other police activities in the course of transporting passengers. John McNesby, president of Fraternal Order of Police Lodge 5, said last month that Pownall had faced "a split-second decision" during his encounter with Jones. "Very easily, we could have had another funeral for an officer on our hands," McNesby said. The July 2010 shooting took place under similarly chaotic circumstances. Williams-Carney, who had recently been released from prison, was stopped by Pownall and his partner at Griscom and Harrison Streets in Frankford. Williams-Carney had a long arrest record, with previous convictions for robbery and drug-related counts, and he was illegally carrying a gun, so he took off running, nervous that he would get locked up again, he recalled last month. Pownall and his partner ran after him, and other police officers in the area joined in the pursuit. The officers fired about 10 shots while chasing Williams-Carney, Pownall later testified. One shot hit Williams-Carney in the back, knocking him to the ground and paralyzing him from the chest down. It is impossible to determine with certainty who shot Williams-Carney because the bullet remains lodged in his body. Pownall, testifying on June 24, 2013, in the federal lawsuit that Williams-Carney brought against the city, said he believed he was the shooter. "Based on my positioning and his positioning and later, where I heard that he got shot at, you can assume that, yes, I fired and I shot him," Pownall testified. Pownall said that he had shot at Williams-Carney because he "could easily have turned and fired at me, and the [other] officers, or even civilians because there are houses." Williams-Carney had tossed his gun away during the pursuit, something Pownall said he did not see. The jury ruled against Williams-Carney in the case, evidently agreeing with Pownall and his fellow officers that the circumstances justified their use of deadly force. Carnell Williams-Carney, 36, sits in a wheelchair at the Somerton Center. "I feel like they half-killed me," Williams-Carney said from his wheelchair last month. "I have a life sentence. I can't buy my legs back." He was watching television news last month when he heard that Pownall had shot someone else. He quickly turned the TV off, disillusioned that Pownall had remained on the job. "It's like he's out there like it's the OK Corral or Wild, Wild West," Williams-Carney said. "How many people does this guy got to kill or maim before somebody does something?" Activists have been raising the same question. Protests have taken place outside the 15th District police station, inside offices at City Hall, and at a news conference involving Mayor Kenney, among other locations. At a protest last month, one of the organizers, Isaac Gardner of North Philadelphia, said the aim was simple: "We want [Pownall] fired and prosecuted." Two other activists — Asa Khalif of Black Lives Matter Pennsylvania and freelance journalist Christopher Norris — have grown more antagonistic recently, confronting Kathleen Martin in City Hall when she was acting district attorney and Managing Director Michael DeBerardinis in his office, and disrupting a Police Advisory Commission meeting. Doretha Crosby (center left), David Jones’ mother, with friends and family in a protest outside 15th Police District headquarters June 19 as Asa Khalif, of Black Lives Matter Pennsylvania, uses a bullhorn. Norris said the protesters have been trying to attract attention and demand answers from city officials who have varying degrees of connection to the Police Department and the Jones case. Jones' family sometimes participates in the protests, although Thomas Jones is a truck driver who is often on the road or sleeping at unconventional hours. David Jones was a long-haul truck driver as well, his father said. When the elder Jones was cleaning his son's house last week, he found the GPS his son used to guide his truck routes. The two used to talk on the phone late at night to keep each other awake behind the wheel. Now Thomas Jones drives with his son's GPS in the cab. "Him and God," he said, "are guiding me on the road."